Trees are beautiful and graceful in a garden of any size. 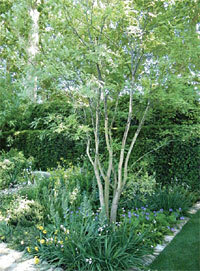 They add structure and a sense of instant maturity to a garden. Yet, when we think of planting our gardens up, we often forget to include trees into the design. Trees are also useful as they attract beneficial insects and birds into the garden. They also absorb carbon dioxide which helps clean the air. Trees can also be considered for their ornamental bark which often becomes the focal point in winter after the trees have lost their leaves. Prunus serrula is a favourite of mine with its ultra smooth coppery bark running around the trunk in concentric rings. Some people polish the bark to make it shine even more! Acer griseum which is also known as the paper bark maple also has a coppery bark but the interesting effect is created by the peeling bark. Like any plant in the garden you will need to look up which soil conditions the tree prefers and whether it will tolerate sun or shade. Most trees tolerate the sun but the Japanese maple like Acer palmatum needs shade and I would recommend planting it under the canopy of another tree. Late winter is an ideal time to consider where you would place a tree as the garden is stripped back to its bare structure. 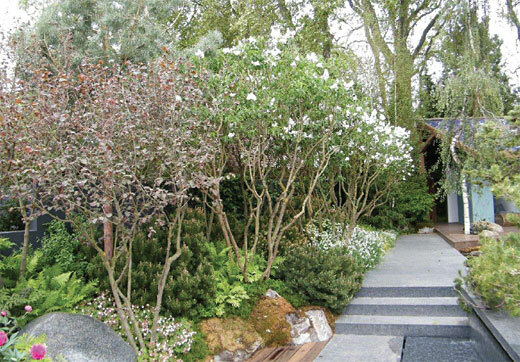 If you need some help to consider the best type of tree and its placement, contact a garden designer who would be able to help you with your decision.